2016 TIGER Grant award winners announced! Did your city win? 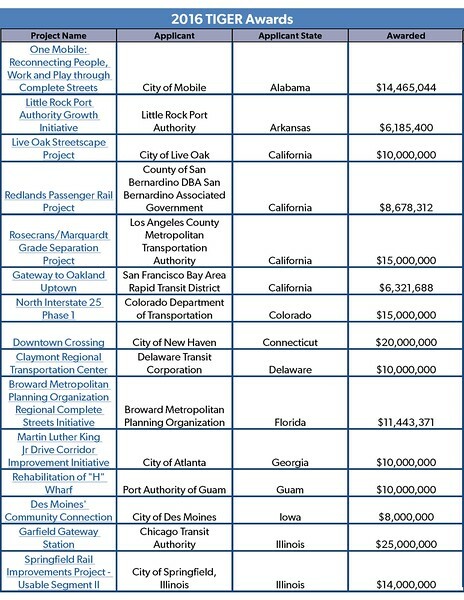 U.S. Transportation Secretary Anthony Foxx recently announced nearly $500 million in available funding for a large list of transportation projects competing for 2016 Transportation Investment Generating Economic Recovery (TIGER) grant program. Funding in this year’s round will be divided among two U.S. territories, 32 states, and 40 communities across the country. 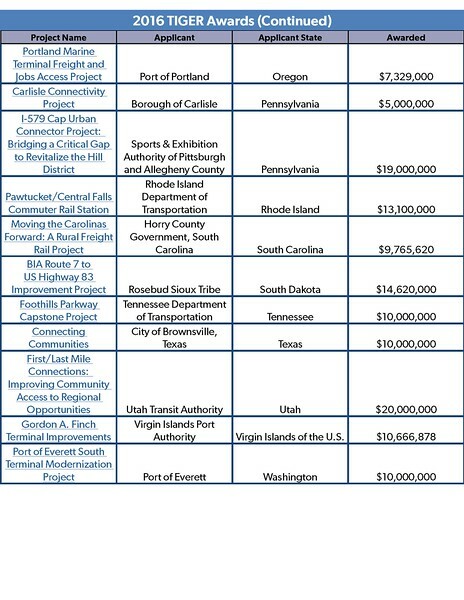 Of interesting note, nearly two-thirds of the winning projects were repeat applicants that worked with the U.S. Department of Transportation to improve their projects. This year’s winners include the City of Des Moines, IA, which plans to invest their $8 million TIGER grant award to rehabilitate four critical urban river crossings and $14 million for Lexington, KY to complete a multi-modal greenway through its downtown.In Baltimore, $10 million will be utilized to add dedicated bus lanes and complete street improvements to North Avenue. In Michigan, the City of Flint hit the jackpot with $20 million in TIGER grant funding being awarded for their plans to reconstruct portions of several arterial roadways as context sensitive complete streets. In Pittsburgh, funding will go to construct a cap over I-579, reconnecting the historic African-American Hill District with downtown Pittsburgh. However, the recent new wasn’t good for every community. Once again, demand for the 2016 TIGER grant program exceeded available funds. 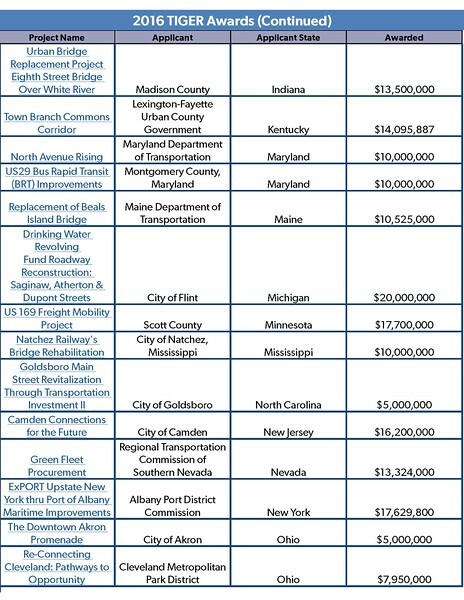 This year, the DOT received 585 eligible applications, collectively requesting over $9.3 billion in funding. This means many agencies such as JAXPORT will have to identify alternative funding sources for their projects. In Jacksonville, JAXPORT applied for a $24 million request seeking to utilize the funds for rail infrastructure upgrades at its Talleyrand Marine Terminal. Nevertheless, JAXPORT was not alone. Roughly $138 million in TIGER grants were awarded to freight-related projects nationwide, making 2016 the lowest share for freight-related projects since the implementation of the annual TIGER program. Here's a look at the 2016 TIGER winners!